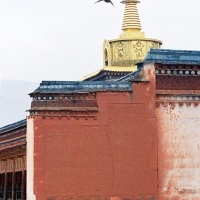 First built in 1710 during the Qing emperor Kangxi's reign (1662-1722), the Labrang Lamasery (or Labrang Monastery) in Xiahe County, Gannan Tibetan Autonomous Prefecture, southern Gansu Province, is one of the six patriarchal lamaseries of the Gelugpa Sect of Lamaism in China (the other five bing Gandan Lamasery, Drepung Lamasery, Sera Lamasery in the Lhasa area, Tashilhungpo Lamasery in Huangzhong, Qinghai Province). Located about 180 kilometers from Lanzhou, the lamasery encompasses 86.7 hectares (214 acres) and about 2.5 kilometers in circumference and has about 10,000 rooms, which are enough to accommodate more than 3,000 lamas. 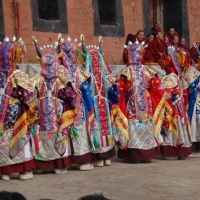 Big, tall and elaborately decorated, the highly artistic monastery breathes a strong religious atmosphere of the Tibetans. 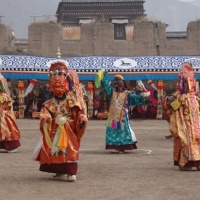 Also the top college of Tibetan Buddhism in Northwest China, the monastery holds seven large-scale summons ceremonies a year, of which the summons ceremony in the first lunar month is the largest. 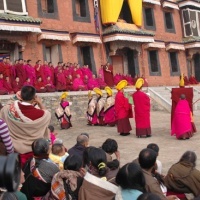 The present summons ceremony, which began in the middle of the 18th century, is based on a ceremony held in 1409 by TsongKha-pa (1357-1419), founder of the Gelugpa Sect. 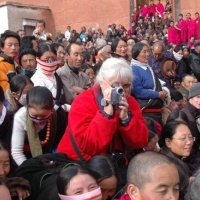 it includes a series of religious activities attendee by both Tibetan monks and pilgrims, such as the free Captive Animals Festival held on the 8th day of the first Tibetan lunar month, The Sun-Bathing Buddha Festival on the 13th day of the month and the Cham dance on the 14th day. In addition to this, all the monks of the monastery will gather in the Grand Sutra Hall to recite Buddhist scriptures six times a day, every day during the period. The sun-Bathing Festival has always been the biggest draw. The monastery boasts six Buddhist institutes (the Institute of Essoteric Buddhism, Higher and Lower Institutes of Theology, the Institute of Medicine, Institute of Astrology and Institute of Law). 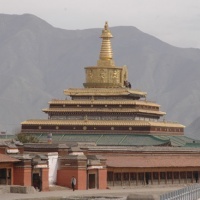 Each of them has a chanting hall, several temple halls, and 18 residences for "the Living Buddhas," 18 Buddhist Lhakangs (living quarters for monks) and a sutra printing house. The pray hall is the principal part of a monastery, where monks study, hold meetings and chant scriptures. The largest, the palatial Grand Prayer Hall belongs to the College of Esoteric Buddhism. In 1985, the hall was burnt down by fire. The central government provided 12 million yuan (US$ 1.45 million) for its reconstruction. After reconstruction in 1990, the hall was expanded to cover about one hectare (2.471 acres). The hall, of wood and clay structure, has the roof supported by 140 giant pillars. It is large enough to accommodate 3,000 monks. The elegantly decorated hall houses portraits of Buddha on its walls and has built-in Buddha shrines and bookcases. Fine "thangka" (sacred painting on cloth) paintings hang from and northwest. 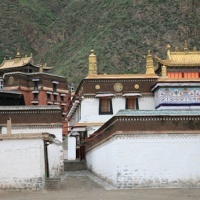 The chanting halls are all located in the northwestern part of the monastery compound and the other five chanting halls are set around the Grand Chanting Hall in a shape similar to a crescent moon. The hall of Maitreya Buddha is representative of the monastery's temple halls and features a strong Nepalese flavor. It houses a 10-meter-high gilded statue of Maitreya Buddha created by Nepalese artisans. E'angzogzhe (1648-1712), the first generation Living Buddha in 1709, founded the monastery. At its height, the monastery housed about 4,000 monks in its 90 halls, with 31 residential and academic buildings, and more than 500 scripture reading rooms. But many building were destroyed during the "cultural revolution" (1966-1976). In the 1990s, most of them were rebuilt or renovated. 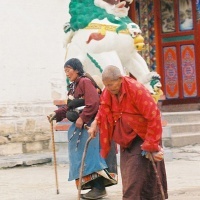 Presently there are about 1,200 monks, coming mostly from Qinghai, Gansu, Sichuan provinces and the Inner Mongolia Autonomous Region. Apart from a spectacular collection of monastic buildings, the Labrang Monastery is also a treasure house. Art treasures are everywhere. Stunning frescoes and tapestries, incredible carpentry, painted Tibetan furniture, white Tibetan scarves, stupas (the cone-shaped jewel-encrusted burial chambers where the bones of Tibetan religious and political leaders are placed) resplendent with jewels. Most enchanting of all are the different kinds of Buddha statues and "thangkas." From the peaceful Sakyamuni (the Present Buddha) and Maitreya (the Future Buddha) covered with huge turquoise medallions and gold ornaments to ferocious nandikesvaras, joy ful Buddha tangled up in multi-armed embraces, from the gilt Tsong Kha-pa to the bronze statue of Jiamuyang 1, from just 1 inch high to 10 meters tall, more than 10,000 statues of Buddha made of gold, silver, copper, aluminum, ivory, sandalwood, jade, crystal and clay build up a mysterious Buddhist world in the flickering light of yak-butter lamps. 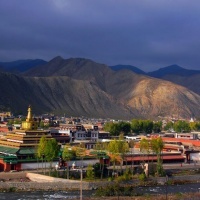 The Labrang Monastery has a collection of Province. The monastery also has one of the richest collections of Buddhist scriptures in the world, boasting nearly 65,000 0f them in 18,200 volumes. These scriptures fall into a dozen categories, including philosophy, collected and craftsmanship. Also included are two volumes of Pattra-leaf sutras, and some 70,000 wood blocks for printing scriptures. The monastery is built in an attractive setting, with the Daxia River winding by to the south and rolling mountains to the south and north. About 14 kilometers up the valley from the monastery, the Sangke Grasslands is an ideal place for hiking or horse-riding, with a limpid lake and snow-capped mountains on all sides. How to get: Take Bus from Lanzhou to Xiahe. Upon your arrival at Xiahe bus station, turn right out of the bus station onto the main road. The monastery entrance is on the right about 1.5km from here. Cost: General entry is free. Tours will cost you RMB25. Tour Information: Entry into the main temple is by tour only. Some of the monks speak passable English and will show you around the Institute of Medicine, the Ser Kung Golden Temple, the Prayer Hall and the museum.The ticket office is on the right of the monastery park (not selling tickets between noon and 2:30pm).